Photos by Juan Ocampo for Metro. Attentive Source readers know that Harriet the tunnel boring machine has been working her way south under Crenshaw Boulevard, digging the first of twin rail tunnels for the Crenshaw/LAX Line. Today was a good day: the machine broke through into the station box for the Martin Luther King, Jr. Station. Pics above. Please feel free to save and share! Next stop: Harriet will continue digging toward the future Leimert Park Station. The August 2016 issue of Machine Design (Volume 88 issue 8) features their lead article (and cover photo of tunnel boring machine) on subways and rail charting high-tech course. Harriet won’t be needed between the Hyde Park and Fairview Heights Stations as this segment will not be, strictly speaking, a tunnel? Correct. 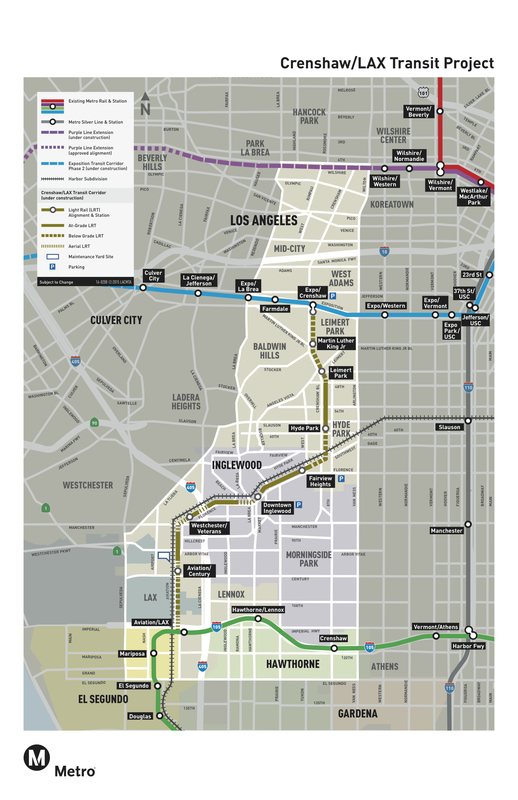 The right of way will be a covered trench performed by cut-and-cover method between Hyde Park and Fairview Heights stations not unlike Expo Line between Jefferson/USC and Expo Park/USC stations. Judging by the pictures…the underground station will have side-platforms instead of center platforms. Correct? The station will have a center platform. How precisely did the TBM hit its mark? And how precise are the tolerances? Like how displaced off the centerline can it get?